I received two shirts a short time ago and they are beautiful!!!! GaryTailor.com suits are made from best fabrics available around the world. We make trips around the world for fabric shows and learn more about latest fabrics and try our best to get them in stock as soon as possible. We also attend lot of Men's fashion shows for us to be updated and give those benefits to our customers. Please note prices do not include shipping and handling charges. England – We carry materials from mills of: Seville Row, Hugo collection, Dormeuil, James Spencer, Kingtex, Ethomas, Wainsheill, Royal Oaks, Reid-Taylor, Schofield and Smith. France – Pierre Cardin and many more. One Vent, Side Vents, No Vents. 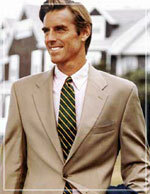 Classic Two Button, Notch Lapel, Three Patch Pockets, Stitched Edges, One Vent, Side Vents, No Vents. Classic Three Button, Notch Lapel, Three Patch Pockets, Stitched Edges, One Vent, Side Vents, No Vents. British Three Button, Notch Lapel, Lower Slant Pockets with Flaps, Slanted Ticket Pocket, Stitched Edges, One Vent, Side Vents, No Vents.